The default email client in Mac OS X is the simply named “Mail” app, and it’s a pretty good mail application, but what if you’d rather use something else, like ThunderBird, Sparrow, pine, or a browser and web mail client like Gmail? That’s when you’ll want to change the default mail app to something else, and it’s super easy to do on any Mac. Note that by changing the default mail app you will change what app launches when you try to send emails from anywhere in Mac OS, whether it’s from another Mac app or a link on the web. Everyones available mail clients will likely be different, depending on what apps are installed on their Mac. In this screenshot example, the possible email reader apps to select are: Google Chrome (for Gmail), Mail.app (the default in Mac OS X), iTerm (for pine, the command line mail client), and Sparrow Lite (a third party mail app). Choosing the “Select” option will bring up a Finder Open window viewer to locate applications stored elsewhere in Mac OS X, whether it’s the Applications folder or somewhere else. If you’re going to download a third party email client like ThunderBird, remember to throw it into the /Applications/ folder before selecting it through the Mail’s default selection procedure. 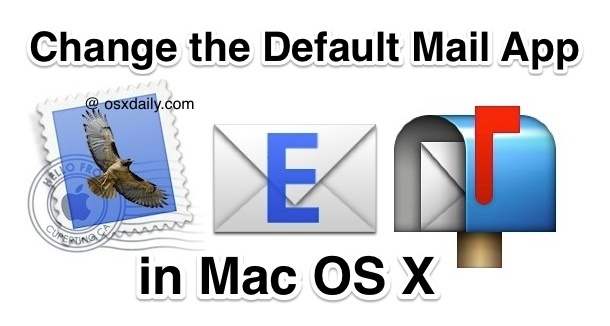 Changing the default Mac Mail app is done this way in all versions of MacOS and Mac OS X, it does not matter what system software version you run. Mail app is a great email client but if it’s not for you, there are plenty of options out there. Happy emailing! Thanks to Mark for the question and tip idea! I was aware that you can change the default in Mail Prefs, but you said that it changes what app launches throughout OSX. I have changed the prefs to Postbox.app, yet if I want to send an email with a photo in iPhoto, Mail still launches. Same is true for some other Apple programs that allow you to email directly. Anyway to get them to launch Postbox? There’s no option like that in Word for Mac (2008) that I can find, it seems like it will always launch Mail when emailing an attachment even after switching to Google Chrome as the preferred email default as described above…..
And Bo is right re: iPhoto, Google Chrome is not an option & they don’t allow new ones to be added. That said, what is the use in changing the default to Google Chrome for email, what does it actually change? Thanks for this. What would really be handy is for when I click on a hidden “mailto” link is for the computer to ask me what I want to do. I cannot count how many times in the past I have been caught by accidentally clicking the hidden link and now my mail app fires up and for the next five minutes it syncs several past emails (I normally use web mail). This is very frustrating especially when this happens when I least expect it. but what if I’ve never set up my Mail with Mac… I can’t get into the preferences…i can’t figure out how to set it up b/c i don’t know my password and there’s nothing that let’s me reset it… any ideas? (it’s not my main computer password, as I tried that). You will need to know your eMail password to set up Mail for Mac. Where ever your email provider is coming from is where you would reset that password. For example, you would use Gmail to reset a Gmail password, etc. If you haven’t figured a way around this yet… I too had not previously set up Mail and did not ever want to set it up w/ an account just to access the preferences. I opened Mail, chose “other” for account type, then typed a random character in each required field, hitting next and repeating through a few “manual set up screens” until it was done, then I could get to preferences. Delete the false account afterwards if you want or leave it in case you need to access the preferences again at a later date (i.e. if you update the mail app through system updates it might revert to the default which is why I ended up here trying to figure it out again). Ahhh, this is awesome. I never would have guessed it would just allow me to click through like that. Thanks!!!! Yohoo – you are a legend. Thanks a million. It will tell you that you need to add more information or that the username is incorrect, but you just need to keep clicking ‘Done’ or ‘Continue’ when you have all the fields filled. It will eventually override and let you in. Thanks Kat for the info! If you enter junk, you press Sign In, and it complains that it can’t confirm. Just keep hitting Sign In — it gives up after a few tries and creates the account. Lol. If you’re trying to set the default as a new application, the Application preferences itself might have an option to set it as default. This should override any other settings. (Worked for me with Outlook 2011, I didn’t have to set up the Mail application on OSX). This worked for me with Outlook 2011, I didn’t have to set up the Mail application on OSX. Look for any way to set this application as default to handle email. This should overwrite and other settings on OSX. If you’re trying to set the default as a new application, the Application preferences itself might have an option to set it as default. This should override any other settings. (Worked for me with Outlook 2011). Thanks Nishad! I was not able to set this through Mail.app without apparently setting up a new account first. Outlook had this option just as you said, Preferences > General. Worked like a charm! This did not work in Outlook 2016 for Mac – nothing under Preferences. Further to previous, I have finally found the solution – obscure, but sorted. Highlighting the saved item icon, File >> Get Info >> expand, open with, set default for all, approve! Bingo. Why always so difficult? Fantastic! You are the MAN! This has saved me much agony. Thank-you, thank-you! That didn’t work so well for me. I went to preferences and my choices were Mail and Select. That’s all. I chose Select, but if I select Firefox and then click on an e-mail (which I did to test it) it causes, no exaggeration, 246 tabs to open and everything freezes. So I hate Mail, and I don’t want to use it, but it keeps popping up anyway. When i select an archive and i choose “share”, my new app for mail doesn’t appear like an option. How can i include this in “share” ?? I wnat saved .eml’s to open in thunderbird (or whatever) when I double click on them instead of going to mail eveytime. Go to finder window. Click on the file once. go get info, command I, there should be a prefernece there saying mail, select thudnerbird if you have it or whatever you want instead. Then select the change all button if you want that to happen everytime. Easy. 20 seconds? um, not really… you can do in less than that IF you are already using Mail. If you aren’t, Mail will force you to add an account before it gives you access to the preferences menu, which kinda defeats the purpose, don’t you think? I mean, I’m using outlook (I have to, work machine) and not Mail and I don’t want to set up Mail with account info just so I can tell Mail I don’t want to use it. It is just hilarious that when I click a mailto link WITHIN outlook, Mail launches and asks me to add an account. wtf? If you come across the additional complication that the mail default email reader setting reverts by itself back to chrome or whatever it was last set to….change the default email client back to Mail (in mail / preferences / general), close the dialog box, quit mail and rebuild your launch services database. see if the default client sticks after that. A reboot after the rebuild won’t hurt either. Thank you sooo much, I was convinced Mail is seriously bugged. Thank you! This was making me buggy. What should I choose after that? Thank you!! Thank you!!! that worked for me!!! I can’t change my default email reader permanently. I’ve added Google.app but after I close Mail it reverts to Mail. How do I make it stay where I put it? Ran into the problem on 2 of may Macs. Found that if I changed the default client in Mail, exited Mail and immediately rebooted the machine the new choice would be “stick” and Mail would now show the new default. I have the same issue as Lynne, trying to change from Thunderbird *TO* mail. Changing default in Mail preferences still reverts to Thunderbird. I also had the problem with my choice (firefox.app) always reverting back to, in my case, chrome.app. So I tried the command line fix above. Now firefox.app is remembered in mail.app as my default. HOWEVER: I no long er have a choice of a mail app when I use the Share pull-down menu! How do I get the choice of a mil app when I use the Share pull-down menu? Or simply put, how can I now mail a web page or link from Safari? One step forward, two back. I change it to outlook but when I close Preferences and open it again it’s changed it back to Mail!? I’m having this identical problem. I change the value in the drop-down, close the preferences and when i go back in it defaults back to “Mail”. I’ve got a related issue that is driving me batty. I want to change my default email client from Mail to Airmail. When I open Mail, it hesitates for a minute, then starts to open dozens (hundreds?) of message windows, along with dialogs about one of the SMTP servers not being available. This happens ad nauseum until I force quit Mail. I cannot get to the preferences while it’s happening…I’ve tried to choose prefs before the windows start multiplying, but it won’t let me. SO – I thought I’d just delete Mail completely, along with all its settings and messages (which are backed up), to prevent the multiple window issue, but I cannot seem to delete Mail using any of the guidance I’ve found without opening Mail first…which causes the problem again. I keep thinking that maybe there is a command line instruction I could use, or something in the about:config menu, but I’m at a loss. All I want is to change the email client…but I can’t keep Mail from opening infinite message windows when I try to change prefs. Any suggestions? Thank you! Using Mail to switch to a different default doesn’t both me. What bothers me is that I can’t switch away from Mail without having to set up Mail first. The preferences menu I need to access isn’t available until after I’ve configured mail to access my e-mail, which is precisely what I don’t want to do. Same issue as most of the above posters, Mail won’t allow you to edit preferences until you create or force it to recognize an account, and even then, it won’t save the edits to the default preferences. Running the launch rebuild command didn’t help much either. It saved the default choice (chrome), but doesn’t do anything when prompted. There is NO default email app feature in either Mail or Thunderbird. What the hell are you guys talking about? 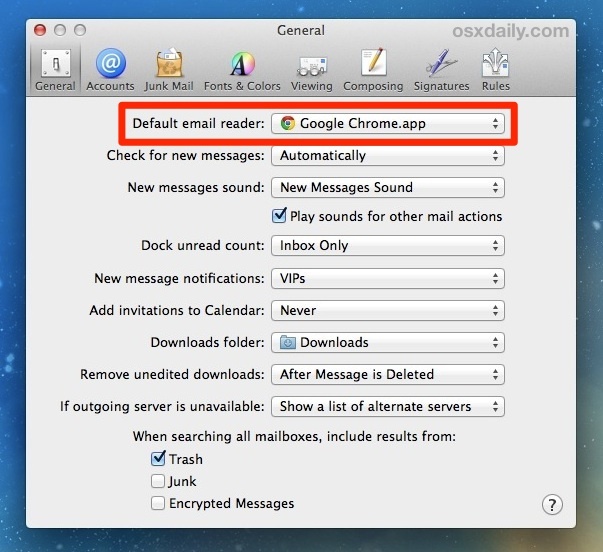 Ed, here is a detailed tutorial describing how to set the default email app on a Mac, it is done through the Mail application. Mail is an app name in Mac OS, the app itself is found in /Applications/ folder. The Mail default setting is in the Mail app Preferences panel under “General” as described in detail in this article. From the Mail app you set Mail or Thunderbird or any other email app as your default email app on Mac. You should read it before commenting. Does changing the mail reader default on Mail app will subsequently change Calendar and Contact as well. If, I set Outlook as a default mail app on MAC OS, then the Outlook will also take over Calendar and Contact function. Is there a way to have email default on Outlook, while keeping the MAC OS native Calendar and Contact? So, Apple thinks it’s acceptable to force everyone to have to set up a mail account, in Apple Mail, before we are even able to set an alternate mail app!? This is anti-competetive behaviour at it’s most blatant! Four years later and this is still the case!? What is wrong with us? Have we really become so numb to the abuse from tech companies?